The master of ceremonies (emcee), as of a television entertainment program, cabaret show, or a variety show. 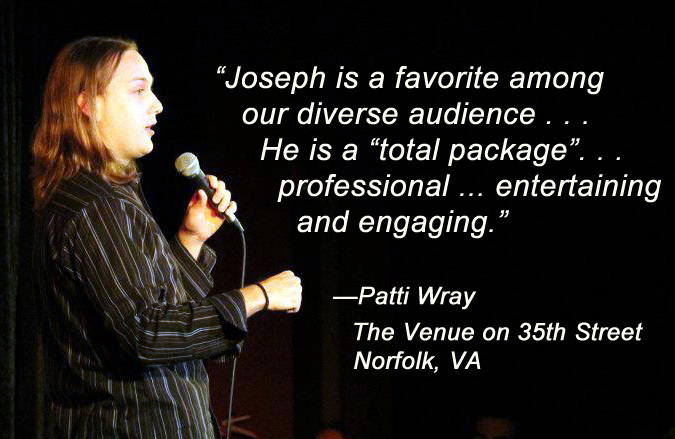 Joseph can provide both laughter and entertainment as the MC or host of your event. 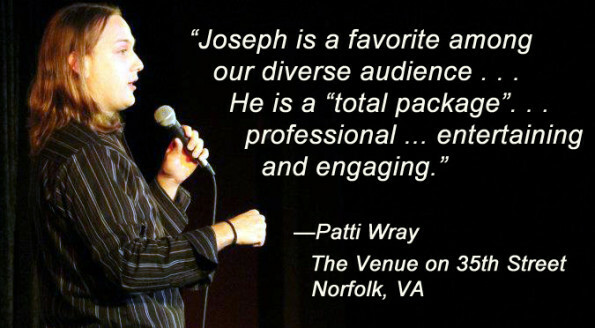 Joseph De Paul as MC-ed shows in Baltimore, MD and Hampton Roads Virginia and is keenly aware of all the important aspects that go in to making a professional show. It could be for a charity show at a hotel ballroom—or a variety show in a 2000 seat theater. Anytime you have a show with multiple acts, you need someone to make the whole evening move along smoothly. Someone to make sure all the acts are ready and brought out properly. Someone who can think on their feet and fill dead time to make sure the show doesn’t loose any steam, or in case something goes wrong. The MC is the one who does just that. When is comes to hiring an MC, you don’t want to take any chances! You need a performer who understands that being an MC is more than just not forgetting the name of the act he’s about to introduce. The MC makes sure that all acts know where they are in the show line up and what they need to be ready to go on stage. He works with the organizer to make sure they get the show they want and deserve. Note: If you wish to hire Joseph De Paul as an MC be sure to do so well before your date. This way Joseph can work with you closely to make sure all the important details are taken care of well ahead of time.